"People Can Make You Feel Guilty"
Welcome to "People Can Make You Feel Guilty"
There is so much jealousy in the world, so many get jealousy of either what you have, or don’t have they turn things around for their benefit. They are so caught up within themselves that they loose sight of the whole picture. My family is just like this in a way, they usually do make you feel guilty of what God has blessed you with. Or, they get upset because you can do things which they cannot, or they assume you have thousand’s just sitting around that all they want is your help, but when you help other’s they get upset. They get upset because you help other’s whom are in need, those without jobs, who need help with something, but when you need the help they all scatter. 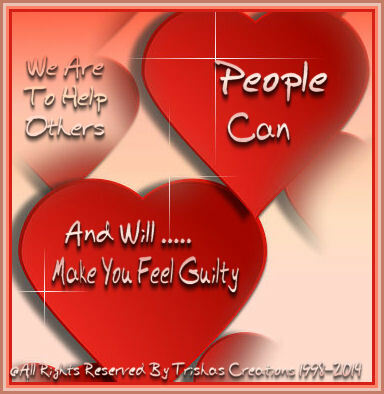 Never allow anyone make you feel guilty, of what God leads you to do, to help other’s. We should never feel guilty, we should never have to apologize for what God leads us to do to reach out to other’s. God places things in our hearts to do and to reach out to other’s, do not allow people to bring you down, by following the leading to help someone. Do NOT allow them to come in between and causing conflict is a sin, don’t let no one bring you into their unhappiness! People will whether family, friends, or just people you come across in the store or through other's. Most, will look at you like, why do you have that, or where did they get that from, how in the world can they afford that, etc. Making people feel guilty and making them feel inferior is a sin, we should NOT make anyone feel like that. Remember how we act reflects on how other's see's as as Followers Of Jesus Christ and the way we act can put a blessing in their lives or it can damper their lives, and cause them to NOT want to be a follower of Jesus.